The first light novel volume of The Irregular at Magic High School published by Dengeki Bunko. It features Tatsuya and Miyuki on the cover. 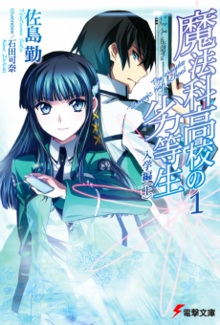 The Irregular at Magic High School (魔法科高校の劣等生, Mahōka Kōkō no Rettōsei, lit. "The Poor Performing Student of a Magic High School") is a Japanese web novel series by Tsutomu Satō. It was published on Shōsetsuka ni Narō, an internet web novel website, between October 2008 and March 2011. Satō reached a deal with Dengeki Bunko and began releasing his work in a light novel format beginning July 2011. In 2013, each story arc received a manga adaptation with varying manga artists and publishers. That same year, an anime adaptation by Madhouse was announced and was broadcast between April and September 2014. The Irregular at Magic High School franchise had been localized for English by two companies: The light novels and one of the manga adaptations are licensed by Yen Press while Aniplex of America licensed the anime series. The anime series was simulcasted on four networks, and was later made available on Netflix. The series has been well received. The light novels appeared on Sugoi Japan's 2015 polls and since 2011, is one of the top selling series in Japan with 7.7 million copies sold as of 2017. In addition, its manga and anime adaptations also appeared on top selling charts. English reviewers had mixed to negative reception towards the anime adaptation. The complex technicality of magic within the series was received warmly but the exposition was criticized for being heavy, unclear, and poorly executed. The story follows Tatsuya Shiba, a bodyguard to his sister Miyuki Shiba who is also a candidate to succeed the leadership of the Yotsuba clan, one of the Ten Master Clans that govern Japan's magicians. They enroll into First High School which segregates its students based on their magical abilities. Miyuki is enrolled as a first course student and is viewed as one of the best students, while Tatsuya is in the second course and considered to be magically inept. However, Tatsuya's technical knowledge, combat abilities, and unique magic techniques cause people to view him as an irregular to the school's standardized rankings. Tatsuya and Miyuki are siblings of the same school year and children to Tatsurou Shiba and the late Miya Yotsuba;LN 3.2 their parents had a loveless forced marriage, and when their mother died, their father married his mistress, Sayuri Furuha, leaving the siblings to live by themselves.LN 6.2 Maya Yotsuba, their aunt and the current leader of the Yotsuba Clan, was the reason Tatsuya was born with the unique magic to decompose, reconstruct, and detonate matter.LN 16.6 Out of fear of his powers, the Yotsuba Clan leadership of that time argued for Tatsuya's death, forcing Miya and Maya to take measures to ensure his survival: the first was Miyuki's creation who would act as a seal to Tatsuya's power; the second was to magically dull Tatsuya's emotions except for his familial love towards Miyuki; and the third was to assign Tatsuya to be Miyuki's bodyguard in order to develop his sense of loyalty towards her.LN 16.6 During a family vacation in Okinawa, Tatsuya warded off an invasion by the Great Asian Alliance and joined the 101 Independent Magic-Equipped Battalion which is headed by Major Kazama Harunobu.LN 8.7 At some point during his life Tatsuya developed an interest in engineering magical technology and commercialized revolutionary technology through his family's company, Four Leaves Technology, under the pseudonymous identity Taurus Silver.LN 3.2 He is voiced by Yuichi Nakamura. Miyuki is considered one of the strongest magicians in the world and is a candidate to succeed her Aunt Maya as the leader of the Yotsuba Clan. Her specialty is freezing magic, and her unique magic allows her to freeze a person's consciousness. In addition, half of her magic casting ability is used to seal Tatsuya's powers. Before the family vacation in Okinawa, Miyuki treated Tatsuya coldly akin to how the other Yotsuba Clan members did. She began to warm up to him and when Tatsuya saved her life, she devoted her entire existence to him. It evolved to the point where she disdains the touch of other males and expresses jealousy towards females around Tatsuya.LN 11.15 Genetically different from Tatsuya despite being born from the same parents, Miyuki professes her love to him following their engagement under Maya's orders.LN 16.6 She is voiced by Saori Hayami. In the polls by Kono Light Novel ga Sugoi!, both Tatsuya and Miyuki ranked as one of the most popular light novel characters. Outside of the franchise, Tatsuya and Miyuki also appear in Dengeki Bunko: Fighting Climax. Tatsuya's group consists of seven classmates whom he spends time with in his daily school life. They often assist Tatsuya during investigations and dangerous situations. Erika Chiba[Jp. 1] is the daughter of the Chiba clan's leader and his mistress, which creates a strained relationship with her family. She has a tomboyish and optimistic personality, and is considered one of the best swordsmen in the clan.LN 7.11 Her magic is used to enhance her sword and combat techniques. She considers Mizuki to be her best friend and has a crush on Tatsuya.LN 8.10 She is voiced by Yumi Uchiyama. Leonhard Saijo[Jp. 2], commonly referred to as Leo, is the grandson of a Fortress Series modified magician.LN 3.4 His grandfather was one of the few survivors of the Fortress Series' instabilities, which causes early death or psychosis. Leo inherited his grandfather's physical augmentations and fears he may also have inherited the Fortress Series' faults.LN 3.4 During combat, Leo uses magic to fortify objects or his own body to augment his combat abilities. He is voiced by Takuma Terashima. Mizuki Shibata[Jp. 3] is a girl with the disposition called crystal eyes which allows her to see the components of magic invisible to most people.LN 3.3 Her ability mentally strains her, requiring her to wear glasses to control her vision. She has a timid, calm, and feminine personality, and is voiced by Satomi Sato. Mikihiko Yoshida[Jp. 4] is a prodigy from the Yoshida clan which specializes in magic dealing with spirits. Years prior to the series Mikihiko failed a summoning ritual which created a psychological block and prevented him from using magic effectively. His involvement with Tatsuya restores his confidence, allowing him to regain his magical talents. He is voiced by Atsushi Tamaru. Honoka Mitsui[Jp. 5] is a descendant of a group of extinct magicians referred to as the Elements.LN 6.7 The Elements specialize in one of the six elements of magic and had loyalty genetically embedded into their genes. Honoka uses light magic, and her genetic loyalty is directed towards Tatsuya. She is voiced by Sora Amamiya. Shizuku Kitayama[Jp. 6] is Honoka's best friend and daughter to an extremely wealthy man.LN 4.1 Shizuku is a mature and tactful girl who rarely shows emotion. She inherited her mother's talent for oscillation magic. She is voiced by Yuiko Tatsumi. The student council is a group of students which provides a liaison between the teachers and students. Meanwhile, the Disciplinary Committee consists of students who are essentially rule enforcers. A third committee is the Extracurricular Activities Federation who ensures that school clubs don't come into conflict with each other. The three committees are closely related and work together to preserve the peace on campus. Mayumi Saegusa[Jp. 8] is the student council president during the Shiba siblings' first year at school.LN 1.2 She puts on a coy and innocent facade but is actually mischievous and highly perceptive. Mayumi is talented as a sniper and her form of offensive magic involves firing dry ice as projectiles.LN 3.5 During the course of the story, she manipulates Miyuki into joining the student council and Tatsuya into the Disciplinary Committee. She develops an attraction to Tatsuya and places him in awkward situations for fun. After enrolling into Magic University, her twin sisters, Kasumi and Izumi Saegusa, enroll into First High.LN 12.6 Mayumi is voiced by Kana Hanazawa. Two people worked alongside Mayumi during the year. The first was Mari Watanabe[Jp. 9] who was the leader of the Disciplinary Committee.LN 1.2 Mari has a tomboyish personality but becomes completely feminine in front of her boyfriend, Chiba Naotsugu, who is also Erika's half brother.LN 4.10 For combat, she uses a whip like blade and uses magic to manipulate chemicals.LN 6.6 Second is Katsuto Jumonji[Jp. 10], the leader of the Extracurricular Activities Federation.LN 2.6 Katsuto is the next head of the Jumonji clan and inherited the clans barrier magic, Phalanx: an impenetrable and perpetual barrier used for defensive and offensive purposes.LN 4.12 Both the Saegusa and Jumonji are members of the Ten Master Clans, forcing Mayumi and Katsuto to be politically involved with the magic community outside of school. Watanabe is voiced by Marina Inoue while Jumonji is voiced by Junichi Suwabe. During the Shiba siblings' second year, Mayumi is succeeded as student council president by Azusa Nakajou[Jp. 11], a timid and youthful looking girl.LN 5.6 Azusa has an interest in magic engineering and suspects Tatsuya is secretly Taurus Silver. She is able to use a unique magic named after her, Azusa Dream, to forcefully pacify people.LN 7.10 Mari is succeeded as chairman of the Disciplinary Committee by Kanon Chiyoda[Jp. 12], an impulsive and good-natured girl.LN 6.1 She is engaged to Kei Isori[Jp. 13], an androgynous and timid boy, and loves him dearly.LN 3.4 Azusa Nakajou is voiced by Saki Ogasawara, Kanon Chiyoda is voiced by Saori Onishi, and Kei Isori is voiced by Sōma Saitō. Masaki Ichijo[Jp. 14] is a first-year student from Third High School and the successor to the head of the Ichijo clan, another of the Ten Master Clans.LN 3.4 His combat magic includes manipulating air, water molecules, and his unique magic allows him to evaporate water within an organism causing it to explode. He is often accompanied by his best friend, Shinkuro Kichijoji[Jp. 15], who is credited as discovering one of the sixteen codes fundamental to magic.LN 3.4 Shinkuro feels indebted to the Ichijo family for adopting him after his parents' death and promises to serve them forever. After losing the nine school competition, they both seek to improve themselves to overcome Tatsuya.LN 5.4 Masaki is voiced by Yoshitsugu Matsuoka while Shinkuro by Ayumu Murase. Haruka Ono[Jp. 16] is an undercover agent for the Ministry of Public Safety who infiltrates the school as a counselor.LN 3.1 She takes both of her duties seriously and frequently assists Tatsuya in gathering information. In addition, Haruka's disposition enhances her innate concealment magic; she trains under Yakumo Kokonoe to further enhance her hiding abilities.LN 3.1 She is voiced by Sakura Tange. Pixy[Jp. 18] is a Home Automation Robot, an android designed to serve humans. She was created and owned by First High's robotics club. During the Visitor Arc, she is used as a physical vessel by one of a group of ethereal supernatural sentient entities referred to as parasites.LN 6.7 The parasite began identifying itself as Pixy, and due to Honoka's presence, has developed feelings of love towards Tatsuya. Tatsuya buys her to prevent the magic community from militarizing the parasite inside her.LN 6.8 She is voiced by Nao Tōyama. Zhou Gongjin[Jp. 19] is a middle-man who orchestrated all major conflicts in the series. He is part of an unknown organization led by Jiedo Heigu[Jp. 20] who wishes to destroy the Yotsuba. Zhou is voiced by Kōji Yusa. Angelina Kudo Shields[Jp. 21] is the leader of the USNA's magician army force known as Stars.LN 7.1 Her military identity is Angie Sirius, and she is one of the thirteen publicly declared strategic magicians. She is voiced by Yōko Hikasa. Tsutomu Satō published his work on the online web novel website, Shōsetsuka ni Narō, between October 12, 2008 and March 21, 2011. At some point during his publication on Syosetu, Satō sent an original work to Dengeki Bunko under a pseudonym.LN 1.A The original work's setting shared similarities to The Irregular at Magic High School causing an editor to deduce his identity and offer him a publication deal.LN 1.A On March 11, 2011, the author announced his work is going to be published as a light novel under the Dengeki Bunko imprint. The author expressed some regret turning free content into paid commodity and cited his financial needs as the reason.LN 1.A The illustrations accompanying the light novels were done by Kana Ishida. The first light novel volume was unable to accommodate the first story arc; deciding against cutting content from the web novel, it was split into two volumes and released a month later.LN 2.A On March 9, 2015, Yen Press announced its licensing of the light novels for English localization through Twitter. Yen Press' first volume was released in April 2016. The siblings Tatsuya and Miyuki Shiba begin their first day at First High School, one of the nine magic high schools in Japan; the school segregates its students as first course or second course based on overall magic ability. Miyuki is considered a prodigy within first course, and is recruited as a member of the Student Council, while Tatsuya faces scorn and prejudice alongside his peers in the second course. A scuffle caused by a first course student reveals Tatsuya's ability to predict magic before it is cast, causing him to be recruited by the Disciplinary Committee through Miyuki's endorsement; in order to defend Miyuki's honor, Tatsuya displays his combat abilities to the Student Council, proving his competency as an enforcer. Shortly after, Tatsuya intervenes in a scuffle between the kendo and kenjutsu clubs and overwhelms the latter with his physical abilities. Tatsuya garners the attention of an anti-magician organization called Blanche, who send a classmate named Sayaka Mibu to recruit him. After Tatsuya declines her invitation, Blanche invades First High to steal its research. Tatsuya and friends foil their attempt and attacks their headquarters in return. Learning that the head of Blanche used mind controlling magic on Sayaka and other student collaborators, Tatsuya was able to establish their innocence, absolving them of any crime. The Nine School Competition is Japan's national sporting event which pits the nine magic schools against each other. Miyuki is elected as a contestant while Tatsuya reluctantly joins the team as an engineer. During the competition, an international criminal syndicate named No Head Dragon makes several attempts to rig the contest by sabotaging First High, which eventually injures their teammate, Mari Watanabe. With Miyuki forced to substitute for her, Tatsuya enlists the help of his friends to assist in his investigation before Miyuki becomes a target of sabotage. It is revealed No Head Dragon has placed bets on the competition and require First High to lose. Tatsuya, Leonhard Saijo, and Mikihiko Yoshida are substituted in as players after No Head Dragon injures the original First High team for the Monolith Code competition, and under Tatsuya's leadership they are able to win first place. After catching a member of No Head Dragon attempting to sabotage Miyuki's equipment, Tatsuya retaliates by killing every member of the organization based within Japan. The competition concludes with First High achieving first place overall. Several characters' summer vacations are highlighted. Most notably: Tatsuya and friends spend the day at Shizuku Kitayama's private resort; Masaki Ichijo and Shinkuro Kichijoji reflect on their defeat by Tatsuya; and Tatsuya recalls shopping with Miyuki at the mall. Afterwards, First High clubs begin planning their officer successions and Tatsuya is asked to convince Azusa Nakajou to become the next Student Council president. Tatsuya is asked to partake in the school's thesis competition. At the same time, his step-mother places an OOPart capable of storing magic into his care. Chen Xiangshan, a military captain from the Great Asian Alliance, leads a team in order to steal the OOPart. During the course of the novel, two First High students affiliated with Chen are detained by authorities after they were caught stealing information from First High's thesis project. The thesis competition begins in Yokohama where an army led by Chen initiates their attack. During the battle, Tatsuya's power and military status is revealed to his close peers; the battle concludes with Tatsuya using matter detonation, a strategic level magic, to destroy the invading naval ship and subsequently an entire Great Asian Alliance harbor. Maya Yotsuba summons Tatsuya and Miyuki to discuss recent events. Miyuki reminisces how she and Tatsuya reached their current status quo. Three years ago, Tatsuya, Miyuki, their mother Miya, and a bodyguard named Hoonami Sakurai were vacationing in Okinawa. There, Miyuki warms up to Tatsuya, and Tatsuya develops a friendship with major Kazama Harunobu. During that time, an invasion by the Great Asian Alliance results in Hoonami's death, and is resolved with Tatsuya's matter detonation. Back in the present, Maya warns Tatsuya that his matter detonation has garnered the attention of the United States of North America (USNA). Following a black hole experiment in the USNA, deserters from the military flee to Japan. The Stars military unit pursue in order to execute the deserters and investigate the magician behind matter detonation. Angelina Kudo Shields infiltrates First High to spy on Tatsuya and Miyuki. As the story progresses, the deserters' abnormal abilities and activities garner the interest of Japan's magic clans. After confronting Angelina and one of the deserters, Tatsuya trades his silence for her information. Tatsuya deduces the deserters are possessed by sentient psychic energy beings which came from the magic dimension during the black hole experiment and are dubbed as parasites. When one of the parasites enters First High, it is defeated by Tatsuya's group and possess the android known as Pixy; the parasite is imprinted with Honoka's feelings and decides to serve Tatsuya. Meanwhile, the USNA suspect Tatsuya is the one behind matter detonation and orders Angelina to assassinate him. Tatsuya defeats Angelina while the Yotsuba clan forces Stars to stand down. Knowing that the eleven other parasites will attempt to retrieve Pixy, Tatsuya's group uses her as bait. Several magic clans attempt to capture the parasites resulting in a large-scale battle. This concludes with Tatsuya and Miyuki destroying nine of the parasites, leaving the remaining two in the custody of the Kudo and Yotsuba clan. As Tatsuya and Miyuki enter their second year, Maya has Minami Sakurai assigned to be Miyuki's bodyguard. Tatsuya and Miyuki's second year begins. A student named Takumi Shippou holds a displaced grudge towards the Saegusa twins, Kasumi and Izumi, causing conflict throughout the novel. Eventually, Takumi's arrogance is quelled by Tatsuya and friends. Meanwhile, Zhou Gongjin and the Saegusa clan cooperate to have the media denounce the magicians of Japan by scapegoating First High, but backfires when Tatsuya learns of their plans and demonstrates the concepts of a magician operated power source. By coincidence, Tatsuya also foils an attack on a famous actress while dealing with Takumi. The Kudo clan have managed to create androids powered by parasites. In order to test these weapons, they decided to place these androids as obstacles in the Steeplechase event of the Nine Schools Competition. Aware of the dangers these weapons would pose to Miyuki, Tatsuya infiltrates and neutralizes the androids before the other players arrive. Behind the scenes, Zhou attempts to sabotage the parasites to discredit magicians as a way to denounce the Yotsuba; fed up with his actions, the Yotsuba begin their manhunt for him. Tatsuya is ordered to participate in the hunt for Zhou. Several clues reveal Zhou is hidden by the traditionalist magicians. Tatsuya requests aid from the Kudo clan who are knowledgeable about the traditionalist. Led by Minoru Kudo, Tatsuya's group confronts the traditionalists in Nara but are unable to find Zhou, leaving Kyoto as the remaining location. Meanwhile, the Saegusa head sends an assassin to kill Zhou in order to destroy any evidence of their coalition. The assassin is killed instead, spurring Mayumi to request Tatsuya's aid in finding his killer. Tatsuya and his companions investigate Zhou's whereabouts in Kyoto and eventually catch and corner him. Zhou then commits suicide, proclaiming someone else will resume his duties. Tatsuya's success forces members of the Yotsuba who despise him to allow Maya to proceed with her plans. Miyuki is summoned to the Yotsuba New Years meeting to commemorate her as the next head of the clan. Several bunke members of the clan attempt to derail Miyuki's attendance as her succession will elevate Tatsuya's status. Upon their arrival, Miyuki is appointed as the next head, and the origins of Tatsuya and Miyuki's birth is revealed. While they are born from the same gametes, Miyuki was genetically modified to act as a seal to his powers. In the next meeting, Maya announces Tatsuya's engagement to Miyuki. Tatsuya and Miyuki adjust to their daily life as their ties to the Yotsuba and engagement have become public knowledge. Meanwhile, a meeting between the master clans take place where they discuss three topics: possible members of the master clan, Tatsuya and Miyuki's marriage, and Saegusa's coalition with the deceased Zhou. Jiedo Heigu, the leader of the organized crime group and Zhou's boss, initiates several bombings against the master clans in order to discredit the magic community. Jiedo's plan succeeds, inciting several hate crimes towards magicians throughout the world. The master clans makes plans to quell public outrage as well as attempts to capture Jiedo. The volume ends with Miyuki and her friends defending themselves against a group of anti-magicians. Tatsuya arrives and neutralizes the anti-magician group. With Miyuki by his side, Tatsuya uses his full powers to search for Jiedo and relay the location to the Yotsuba. The master clans then assemble a unit to capture Jiedo, who is instead killed by the USNA during the mission. Japan has recently completed an artificial island in Okinawa to mine resources from the ocean. In response, a rebellion cell from the Great Asian Alliance and the Australian military work together to destroy the island in order to keep the world's power in check. The Yotsuba send Tatsuya to pacify the saboteurs and to protect the island. At the same time, the senior class of First High's graduation party is taking place nearby. As the attack on the island commences, members of First High and Tatsuya quell and capture the rebels. The Brazilian government's utilization of their strategic magician creates chaos and fear to non-magicians throughout the world, causing a political cold war to take place. The New Soviet Union mounts an attack on Japan's navy, forcing Tatsuya to intervene. As tensions between the world's superpowers rise, the USNA and New Soviet Union make plans to neutralize Tatsuya. The Tooyama clan, a magician branch loyal to the government, evaluate Tatsuya as a threat. Several black ops led by Tsukasa Tooyama are used to assess Tatsuya's abilities and to determine a countermeasure should he become an enemy of the country. In retaliation, Tatsuya is ordered by Maya to break into the Tooyama stronghold and to free the captured USNA soldiers based within Japan; he succeeds and Tooyama ends her operations, having discovered the Jumonji clan can stop Tatsuya. The Irregular at Magic High School had several manga adaptations with various artists and publishers; each manga adaptation covered a story arc from the original light novel series. The first adaptation was by Fumino Hayashi and Tsuna Kitaumi and covered the Enrollment Arc of the light novels. The latest manga adaptation is drawn by Yuzuki N Dash and covers the President Election Arc and is currently ongoing. A spin-off manga titled The Honor Student at Magic High School (魔法科高校の優等生, Mahōka Kōkō no Yūtōsei) by Yu Mori premiered in Dengeki Daioh's June 2012 issue. It is currently ongoing, and was collected into seven tankōbon volumes under the Dengeki Comics Next imprint. Yen Press licensed the series' tankōbon volumes for a North American release; the first volume is localized in November 2015. An anime adaptation of the light novel was announced during the Dengeki Bunko Fall Festival on October 6, 2013. It is directed by Manabu Ono and animated by Madhouse. It premiered on Tokyo MX, Gunma TV, and Tochigi TV on April 6, 2014; nine other networks and three streaming services broadcast the series afterwards. The final episode premiered on September 28. The individual episodes were later encapsulated into ten DVD and Blu-ray volumes released between July 2014 and April 2015. Three related media to the anime were created. The first is a super deformed short series titled Get to Know Magic Studies![Jp. 48] by Aniplex. These shorts were uploaded on Aniplex's YouTube channel, and was later English subtitled and uploaded on Aniplex of America's channel. An internet radio show titled The Irregular at Magic High School Web Radio Full Bloom! Bloom Broadcasting Committee[Jp. 49], premiered on March 23, 2014 and is hosted by Sora Amamiya and Yuiko Tatsumi, the voice actresses for Honoka Mitsui and Shizuku Kitayama respectively; the radio show episodes was later made available for purchase on CD. The third is a radio drama DVD which was released in December 2014 and is based on the light novel's Recollection Arc. An anime film called The Irregular at Magic High School The Movie: The Girl Who Calls the Stars[Jp. 50] was revealed in the 19th light novel volume which was released in March 2016. The film is scripted by the series creator, Tsutomu Satō, and premiered in Japan on June 17, 2017. In the United States, Aniplex of America released the movie in theaters and on home video. Three video game adaptations have been made for the franchise. The first is The Irregular at Magic High School: Out of Order by Bandai Namco Entertainment. It is a 3D fighting game for the PlayStation Vita and was released on December 25, 2014. The second game is The Irregular at Magic High School: School Magicus Battle[Jp. 51], a Japanese role-playing game by Mobage. It was made available for Android, iOS, and feature phone on June 9, 2014. The third game is The Irregular at Magic High School: Lost Zero, developed by BeXide and published by Square Enix. It was made available for Android and iOS on September 4, 2014. The light novels have been well received. They were ranked seventh in Sugoi Japan 2015 polls and since 2011, was one of the top selling light novel series in Japan. As of 2014, 5.3 million copies of the light novel have been sold. In addition, its manga and anime adaptations also appeared on top selling charts. As of 2017, the light novel series has sold 7.7 million copies. Anime News Network had four editors review the first episode of the anime: Carl Kimlinger saw potential in its take on a typical anime premise, praising Tatsuya as the lead protagonist and its handling of mysteries surrounding the plot; Theron Martin, although hopeful because of its male lead and plot concept, expressed criticism towards the indistinguishable animation and constant exposition for the viewers; and Rebecca Silverman felt that it was bland and nothing special. The fourth reviewer, Hope Chapman, expressed immediate dislike towards the series, criticizing it for lacking anything to engage the viewers and for being a lazy adaptation of a light novel, and concluding the review with "I can't even remember the last time I saw something with not a single redeeming factor or thing to recommend about it at all." Silverman reviewed the series future episodes. Plotwise, she praised the Enrollment Arc's underline on standardized testing, criticized the Nine Schools Competition Arc for its execution and weak exposition, and felt the characters were uninteresting. Silverman felt the series doesn't live up to its potential and cited the background music and stilted animations as possible reasons. Chris Beveridge's review for Fandom Post was highly positive towards the anime series, calling it a dark horse contender as one of their top new anime series of the year. Beveridge praised the technical and fundamental aspects of magic in the series for breaking the supernatural approach other works usually take and liked the potential impact it could have on future events. However, while the reviewer liked the series' technicality, they noted it will frustrate certain viewers in that aspect. Richard Eisenbeis, writing for Kotaku, liked the characters, story, the complex and technical magic system, and mysteries. However, Eisenbeis criticized the exposition, citing it to be poorly timed, heavy, and failing to explain things with better clarity. He concluded his review by writing how the anime might have been great if a different director or screenwriting was hired. ^LN represents the Light Novel of the series in the format of X.Y, where X represents the volume and Y represents the chapter. Chapter A represents the afterword of the novel. ^ よくわかる魔法科!, Yoku Wakaru Mahōka! ^ "The Irregular At Magic High School Set 1 Blu-Ray". Right Stuf Inc. Retrieved January 21, 2018. ^ a b c d e f g h i j k l "Staff and Cast". Mahouka.Us. Archived from the original on September 29, 2015. Retrieved October 2, 2015. ^ Kono Light Novel ga Sugoi! 2014 (in Japanese). Takarajimasha. November 20, 2013. ISBN 978-4-8002-1954-1. ^ "Toradora's Taiga, The Irregular at Magic High School's Miyuki Join Dengeki Bunko Fighting Climax". Anime News Network. May 9, 2014. Retrieved October 24, 2015. ^ "Kanon Chiyoda character profile". Mahouka.Us. Archived from the original on October 12, 2015. Retrieved October 2, 2015. ^ "Kei Isori character profile". Mahouka.Us. Archived from the original on October 12, 2015. Retrieved October 2, 2015. ^ "Haruka Ono character profile". Mahouka.Us. Archived from the original on October 12, 2015. Retrieved October 2, 2015. ^ "Yakumo Kokonoe character profile". Mahouka.Us. Archived from the original on October 12, 2015. Retrieved October 2, 2015. ^ "Pixy character profile". Mahouka.Us. Archived from the original on October 12, 2015. Retrieved October 2, 2015. ^ "Zhou Gongjin character profile". Mahouka.Us. Archived from the original on October 12, 2015. Retrieved October 2, 2015. ^ "Angelina Out of Order profile" (in Japanese). Bandai Namco Entertainment. Retrieved October 24, 2015. ^ Satō, Tsutomu (March 3, 2011). "Important Announcement" (in Japanese). Syosetu.com. Archived from the original on December 5, 2011. Retrieved August 4, 2015. ^ a b 魔法科高校の劣等生 1 (in Japanese). Dengeki Bunko. Retrieved December 26, 2013. ^ "Yen Press Licenses Irregular at Magic High School Light Novels, Manga". Anime News Network. March 9, 2015. Retrieved October 24, 2015. ^ a b "The Irregular at Magic High School, Vol. 1 (light novel)". Hachette Book Group. Retrieved January 2, 2018. ^ 魔法科高校の劣等生 2 (in Japanese). Dengeki Bunko. Retrieved August 4, 2015. ^ "The Irregular at Magic High School, Vol. 2 (light novel)". Hachette Book Group. Retrieved January 2, 2018. ^ 魔法科高校の劣等生 3 (in Japanese). Dengeki Bunko. Retrieved August 4, 2015. ^ "The Irregular at Magic High School, Vol. 3 (light novel)". Hachette Book Group. Retrieved January 2, 2018. ^ 魔法科高校の劣等生 4 (in Japanese). Dengeki Bunko. Retrieved August 4, 2015. ^ "The Irregular at Magic High School, Vol. 4 (light novel)". Hachette Book Group. Retrieved January 2, 2018. ^ 魔法科高校の劣等生 5 (in Japanese). Dengeki Bunko. Retrieved August 4, 2015. ^ "The Irregular at Magic High School, Vol. 5 (light novel)". Hachette Book Group. Retrieved January 2, 2018. ^ 魔法科高校の劣等生 6 (in Japanese). Dengeki Bunko. Retrieved August 4, 2015. ^ "The Irregular at Magic High School, Vol. 6 (light novel)". Hachette Book Group. Retrieved January 2, 2018. ^ 魔法科高校の劣等生 7 (in Japanese). Dengeki Bunko. Retrieved August 4, 2015. ^ "The Irregular at Magic High School, Vol. 7 (light novel)". Hachette Book Group. Retrieved January 2, 2018. ^ 魔法科高校の劣等生 8 (in Japanese). Dengeki Bunko. Retrieved August 4, 2015. ^ "The Irregular at Magic High School, Vol. 8 (light novel)". Hachette Book Group. Retrieved January 2, 2018. ^ 魔法科高校の劣等生 9 (in Japanese). Dengeki Bunko. Retrieved August 4, 2015. ^ "The Irregular at Magic High School, Vol. 9 (light novel)". Yen Press. Retrieved April 3, 2018. ^ 魔法科高校の劣等生 10 (in Japanese). Dengeki Bunko. Retrieved August 4, 2015. ^ "The Irregular at Magic High School, Vol. 10 (light novel) - Yen Press". www.b2c.hachettebookgroup.com. Retrieved 2018-11-11. ^ 魔法科高校の劣等生 11 (in Japanese). Dengeki Bunko. Retrieved August 4, 2015. ^ "The Irregular at Magic High School, Vol. 11 (light novel) - Yen Press". www.b2c.hachettebookgroup.com. Retrieved 2018-11-11. ^ 魔法科高校の劣等生 12 (in Japanese). Dengeki Bunko. Retrieved August 4, 2015. ^ "The Irregular at Magic High School, Vol. 12 (light novel) - Yen Press". www.b2c.hachettebookgroup.com. Retrieved 2018-11-11. ^ 魔法科高校の劣等生 13 (in Japanese). Dengeki Bunko. Retrieved August 4, 2015. ^ 魔法科高校の劣等生 14 (in Japanese). Dengeki Bunko. Retrieved August 4, 2015. ^ 魔法科高校の劣等生 15 (in Japanese). Dengeki Bunko. Retrieved August 4, 2015. ^ 魔法科高校の劣等生 16 (in Japanese). Dengeki Bunko. Retrieved August 4, 2015. ^ 魔法科高校の劣等生 17 (in Japanese). Dengeki Bunko. Retrieved August 9, 2015. ^ 魔法科高校の劣等生 18 (in Japanese). Dengeki Bunko. Retrieved October 26, 2015. ^ 魔法科高校の劣等生 19 (in Japanese). Dengeki Bunko. Retrieved March 7, 2016. ^ 魔法科高校の劣等生(20) (in Japanese). Dengeki Bunko. Retrieved September 11, 2016. ^ 魔法科高校の劣等生(21) (in Japanese). Dengeki Bunko. Retrieved February 8, 2017. ^ 魔法科高校の劣等生(22) (in Japanese). Dengeki Bunko. Retrieved April 7, 2017. ^ 魔法科高校の劣等生（23） (in Japanese). Dengeki Bunko. Retrieved December 24, 2017. ^ "魔法科高校の劣等生（２７） 急転編 | 魔法科高校の劣等生 | 書籍情報 | 電撃文庫公式サイト". 電撃文庫公式サイト (in Japanese). Retrieved 2018-11-02. ^ "GFantasy January 2012 volume" (in Japanese). Square Enix. Retrieved August 4, 2015. ^ "GFantasy October 2013 volume" (in Japanese). Square Enix. Retrieved August 4, 2015. ^ "The Irregular at Magic High School 1" (in Japanese). Square Enix. Retrieved August 4, 2015. ^ "The Irregular at Magic High School 4" (in Japanese). Square Enix. Retrieved August 4, 2015. ^ a b "GFantasy November 2013 volume" (in Japanese). Square Enix. Retrieved August 4, 2015. ^ "The Irregular at Magic High School: Nine Schools Competition Arc 1" (in Japanese). Square Enix. Retrieved August 4, 2015. ^ "The Irregular at Magic High School: Nine Schools Competition Arc 5" (in Japanese). Square Enix. Retrieved August 18, 2018. ^ "Mahōka Kōkō no Rettōsei: Yokohama Sōran-hen Manga Ends". Anime News Network. August 19, 2015. Retrieved October 24, 2015. ^ "The Irregular at Magic High School: Yokohama Disturbance Arc 1" (in Japanese). Square Enix. Retrieved August 4, 2015. ^ "The Irregular at Magic High School: Yokohama Disturbance Arc 5" (in Japanese). Square Enix. Retrieved August 4, 2015. ^ "Dengeki Daioh April 2014 issue released" (in Japanese). Dengeki Daioh. February 26, 2014. Retrieved August 4, 2015. ^ "Dengeki Daioh September 2015 issue released" (in Japanese). Dengeki Daioh. July 24, 2015. Retrieved October 2, 2015. ^ a b "Official Recollection Arc website" (in Japanese). Dengeki Daioh. Archived from the original on September 18, 2015. Retrieved August 4, 2015. ^ "The Irregular at Magic High School: Raihōsha-hen Manga Ends in 7th Volume". Anime News Network. Retrieved 17 August 2018. ^ a b "The Irregular at Magic High School: Double Seven Manga Ends in 3rd Volume". Anime News Network. Retrieved 17 August 2018. ^ "Irregular at Magic High School's 'President Election Arc' Manga Approaches Climax". Anime News Network. Retrieved 7 October 2018. ^ "Dengeki Daioh June 2012 issue" (in Japanese). Fujisan.co.jp. Retrieved August 4, 2015. ^ "Official The Honor Student at Magic High School website" (in Japanese). Dengeki Daioh. Retrieved August 4, 2015. ^ "Yen Press Confirms Mahōka Kōkō no Yūtōsei Manga License". Anime News Network. March 9, 2015. Retrieved August 4, 2015. ^ "The Honor Student at Magic High School Vol. 1". Hachette Book Group. Archived from the original on 2015-08-10. Retrieved August 4, 2015. ^ 魔法科高校の優等生1. Kadokawa (in Japanese). Retrieved June 20, 2017. ^ "The Honor Student at Magic High School, Vol. 1 - manga". Amazon.com. Retrieved June 20, 2017. ^ 魔法科高校の優等生2. Kadokawa (in Japanese). Retrieved June 20, 2017. ^ "The Honor Student at Magic High School, Vol. 2 - manga". Amazon.com. Retrieved June 20, 2017. ^ 魔法科高校の優等生3. Kadokawa (in Japanese). Retrieved June 20, 2017. ^ "The Honor Student at Magic High School, Vol. 3 - manga". Amazon.com. Retrieved June 20, 2017. ^ 魔法科高校の優等生4. Kadokawa (in Japanese). Retrieved June 20, 2017. ^ "The Honor Student at Magic High School, Vol. 4 - manga". Amazon.com. Retrieved June 20, 2017. ^ 魔法科高校の優等生5. Kadokawa (in Japanese). Retrieved June 20, 2017. ^ "The Honor Student at Magic High School, Vol. 5 - manga". Amazon.com. Retrieved June 20, 2017. ^ 魔法科高校の優等生6. Kadokawa (in Japanese). Retrieved June 20, 2017. ^ "The Honor Student at Magic High School, Vol. 6 - manga". Amazon.com. Retrieved June 20, 2017. ^ 魔法科高校の優等生7. Kadokawa (in Japanese). Retrieved June 20, 2017. ^ "The Honor Student at Magic High School, Vol. 7 - manga". Amazon.com. Retrieved June 20, 2017. ^ 魔法科高校の優等生8. Kadokawa (in Japanese). Retrieved June 20, 2017. ^ "The Honor Student at Magic High School, Vol. 8". Yen Press. Retrieved April 3, 2018. ^ 魔法科高校の優等生9. Kadokawa (in Japanese). Retrieved October 23, 2018. ^ a b "Mahōka Kōkō no Rettōsei Novels Gets Anime". Anime News Network. October 6, 2013. Retrieved August 7, 2015. ^ a b "The Irregular at Magic High School" series information" (in Japanese). Agency for Cultural Affairs. Retrieved July 11, 2015. ^ "The Irregular at Magic High School broadcasting networks" (in Japanese). Mahouka.jp. Archived from the original on March 29, 2014. Retrieved August 8, 2015. ^ "The Irregular at Magic High School DVD and Blu-ray 1" (in Japanese). Mahouka.jp. Archived from the original on 2015-07-29. Retrieved August 12, 2015. ^ "The Irregular at Magic High School DVD and Blu-ray 10" (in Japanese). Mahouka.jp. Archived from the original on 2015-08-05. Retrieved August 12, 2015. ^ "Aniplex of America to Stream The Irregular at Magic High School and Mushishi: The Next Chapter". Anime News Network. March 22, 2014. Retrieved August 8, 2015. ^ "Aniplex of America Announces Plans to Release The Irregular at Magic High School on Blu-ray". Anime News Network. April 7, 2015. Retrieved August 8, 2015. ^ "Mekakucity Actors and The Irregular at Magic High School to Stream on Four Sites". Anime News Network. April 4, 2014. Retrieved August 8, 2015. ^ "Hanabee Announcements page". Hanabee Entertainment. Archived from the original on May 23, 2015. Retrieved August 8, 2015. ^ "Hanabee Licenses The Irregular at Magic High School". Hanabee Entertainment. Archived from the original on March 3, 2015. Retrieved August 8, 2015. ^ "Netflix Streams The Irregular at Magic High School". Anime News Network. November 16, 2014. Retrieved August 8, 2015. ^ "Animax Asia to Air Irregular at Magic High School, Wizard Barristers This Month". Anime News Network. July 6, 2015. Retrieved August 10, 2015. ^ "Yoku Wakaru Mahōka!" (in Japanese). Mahouka.jp. Retrieved August 10, 2015. ^ "Get to Know Magic Studies!". Mahouka.us. Retrieved August 10, 2015. ^ "The Web Radio for The Irregular at Magic High School begins!" (in Japanese). Mahouka.jp. Retrieved August 11, 2015. ^ "The Irregular at Magic High School Web Radio Full Bloom! Bloom Broadcasting Committee CD" (in Japanese). Amazon.co.jp. Retrieved August 11, 2015. ^ "Audio Drama DVD" (in Japanese). Dengeki Bunko. Retrieved August 12, 2015. ^ "Audio Drama DVD release date" (in Japanese). Amazon.co.jp. Retrieved August 12, 2015. ^ "Irregular at Magic High School Light Novels Get Film". Anime News Network. March 9, 2016. Retrieved March 9, 2016. ^ "Irregular at Magic High School Film Reveals June 17 Opening, New Visual". Anime News Network. February 9, 2017. Retrieved February 9, 2017. ^ Hodgkins, Crystalyn (June 10, 2017). "Aniplex USA Hosts U.S. Premiere of Irregular at magic high school Anime Film at Anime Expo Before Wider Release". Anime News Network. Retrieved April 9, 2018. ^ Ressler, Karen (March 30, 2018). "Aniplex of America Sets Irregular at magic high school Film's Blu-ray Release for July". Anime News Network. Retrieved April 9, 2018. ^ "The Irregular at Magic High School: Out of Order" (in Japanese). Bandai Namco Entertainment. Retrieved August 11, 2015. ^ "The Irregular at Magic High School: School Magicus Battle released" (in Japanese). DengekiOnline.com. June 10, 2014. Retrieved August 11, 2015. ^ "The Irregular at Magic High School: Lost Zero released". dengekionline.com (in Japanese). September 4, 2014. Retrieved October 26, 2015. ^ "Sugoi Japan 2015 award". Sugoi-Japan.jp. Archived from the original on August 6, 2015. Retrieved August 1, 2015. ^ "Top-Selling Light Novels in Japan: 2011". Anime News Network. November 30, 2011. Retrieved October 24, 2015. ^ "Top-Selling Light Novels in Japan by Volume: 2015 (First Half)". Anime News Network. June 2, 2015. Retrieved October 24, 2015. ^ "The Irregular at Magic High School" (in Japanese). Sugoi-Japan.jp. Retrieved October 24, 2015. ^ "Japanese Comic Ranking, June 29-July 5". Anime News Network. July 8, 2015. Retrieved October 24, 2015. ^ "Top-Selling Animation in Japan by Title: 2015 (First Half)". Anime News Network. June 17, 2015. Retrieved October 24, 2015. ^ "The irregular at magic high school The Movie -The Girl Who Summons the Stars-". The irregular at magic high school The Movie -The Girl Who Summons the Stars-. Retrieved 2018-06-06. ^ a b "The Spring 2014 Anime Preview Guide: The Irregular at Magic High School". Anime News Network. April 5, 2014. Retrieved March 18, 2015. ^ Silverman, Rebecca (July 13, 2015). "Blu-Ray 1 - Enrollment Arc". Anime News Network. Retrieved October 24, 2015. ^ a b Silverman, Rebecca (September 18, 2015). "Blu-Ray 2 - Nine Schools Competition Arc". Anime News Network. Retrieved October 24, 2015. ^ Beveridge, Chris (July 4, 2015). "The Irregular at Magic High School Set 1 Blu-ray Anime Review". Fandom Post. Retrieved October 24, 2015. ^ Beveridge, Chris (September 16, 2015). "The Irregular at Magic High School Set 2 Blu-ray Anime Review". Fandom Post. Retrieved October 24, 2015. ^ a b Eisenbeis, Richard (October 31, 2014). "The Irregular at Magic High School Tells an Entertaining Story Poorly". Kotaku. Retrieved October 24, 2015. This page was last edited on 23 April 2019, at 23:20 (UTC).